The 2019 winners the Florence Reinauer Memorial Music Award ($2,500) & the Marjorie Vandervoort Vocal Award ($1,200) have been named. The Ridgewood Choral is pleased to announce Soprano Laura Cardona of Wayne, NJ as the winner of the 2019 Florence Reinauer Memorial Music Award of $2,500 for excellence in instrumental or vocal performance. The award is given to a high school senior who intends to continue his or her musical education at an institute of higher learning. Instituted in 1967, the fund was later endowed by Franklin Reinauer as a memorial to his wife Florence. To date the Choral has awarded more than $45,000 to encourage talented young musicians. The Marjorie Vandervoort Vocal Award in the amount of $1,200 was instituted in 2018 in honor of Marjorie Vandervoort’s 25 years as Music Director. Tenor Joseph Bucci of Mahwah, NJ is this year’s winner. 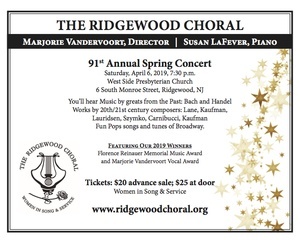 Ms. Cardona and Mr. Bucci will perform at the Ridgewood Choral 91st Anniversary Spring Concert on Saturday, April 6 at 7:30 pm at West Side Presbyterian Church in Ridgewood. To apply next year, please apply on this website in February 2020. Welcome to the Ridgewood Choral’s 91st season of “Women in Song and Service”. Every time I sit down to write something about the Choral, it amazes me how much we accomplish every year. Under Marge’s leadership, we present our audience with beautiful classics, beloved standards and sometimes challenge them with new music. As well, we offer support to our community and to each other in so many ways. Over the past ten years I have loved the singing aspect of being a member of the Ridgewood Choral, but I have also loved volunteering my time to help run the organization. It is through the volunteering that I have come to really know so many wonderful women other than those who sit next to me in the alto section. Working on the fundraising campaign has allowed me to get to know some of the sopranos, the slideshow helped me learn about members past and present and being the librarian has helped me get to know everyone!!! This year the Board hopes to involve a “few good women” to help out with some of the smaller jobs needed to help make our 91st another great season. Nothing is too involved or time consuming, and there is always someone available to give guidance or answer any questions you may have. It is a great opportunity to get to know your fellow singers in sections other than your own. There will be a sign-up sheet at the meeting as well as our Holiday Musicale rehearsals. Please consider volunteering. And now for the singing – the first rehearsal for the Holiday Musicale will be on Friday, October 26th, from 10:00-12:00 at the Unitarian Society of Ridgewood. There will be no rehearsal on November 23rd (the day after Thanksgiving). We will perform at Van Dyk Park Place on Friday, November 30th at 2:00 (rehearsal prior). Our Holiday Musicale will be at the Unitarian Society on Friday, December 7th at 1:00. This year rehearsals for the Spring Concert will begin on Friday, January 4th and will run from 10:00 – 12:00 at the Unitarian Society. Wednesday rehearsals will begin on February 20th from 12:45 – 2:45. Our concert date is earlier this year, Saturday, April 6th at 7:30pm at the West Side Presbyterian Church. My friend Dmitri and I will be giving a recital on February 24th at the Unitarian Society. It will benefit the Florence Reinauer Memorial Scholarship Fund. I hope you will put this on your calendar – we’d love to have lots of friendly faces in the audience! These are the dates as of now, but please be aware that things may be modified or schedules may change due to weather or any unforeseen circumstances. I look forward to another wonderful year of making music with all of you and I hope that we will have the chance to work together in other ways as well. Thank you for everything you all do to make the Ridgewood Choral such a wonderful group to be a part of.